City clerk Devon Reid at the Sept. 25 City Council meeting. Reid announced in a Thursday Facebook post that Evanston will implement a two-step review process for Freedom of Information Act claims. 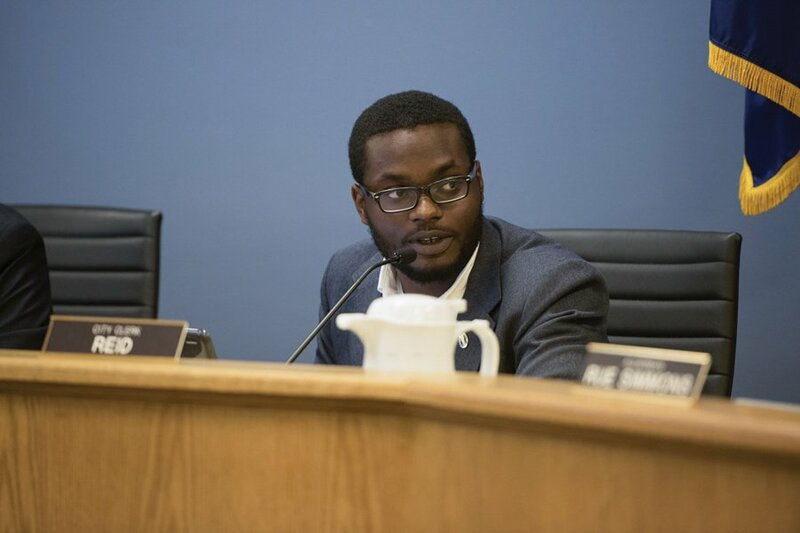 City clerk Devon Reid argued in a Facebook statement Thursday to keep jurisdiction over Freedom of Information Act requests under the sole purview of his office. Reid has been staunchly opposed to a vote by City Council that would appoint a city official to oversee FOIA requests, contending on Facebook that claims should be kept “under the complete authority of an elected and independent office.” In addition, he outlined a new two-step redaction review for all FOIA claims. “In order to protect the public’s interest, ALL FOIA requests, FOIA responses, and related communication should be processed and deposited in the Clerk’s office; an elected office that answers directly to the residents of Evanston,” the statement said. Aldermen voted Sept. 25 to designate a FOIA appointee after residents expressed concern about sensitive information in the online NextRequest database. Ald. Donald Wilson (4th) said at the meeting that the database had made public the names of juvenile offenders and survivors of sexual assault. Aldermen also voted to make the database temporarily private so the information could be retracted. As part of Reid’s new redaction process, Evanston would begin to use NextRequest’s embargo feature, according to the statement. This would result in an increased redaction screening period — five to 10 days — to ensure no sensitive information is posted online. Additionally, certain FOIA requests, such as police and arrest reports, would not be made public on the database but instead be sent only to the requester. Evanston residents have previously been able to request access to public records on NextRequest, which publishes the information in accordance with Illinois FOIA amendments.